Little did I know, it’s easier to correct this problem than you think — if you have the right web browser. 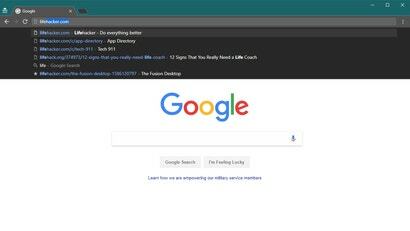 Here’s how to delete autocomplete address bar suggestions in the “big four” browsers. Start typing in a website’s address. When your browser begins to auto-populate the wrong address in Chrome’s address bar, hold down Shift and Function on a Mac — or just Shift on Windows — and tap the Delete key. Once you see a website highlighted, you can also tap the up and down arrows on your keyboard to pull up any proposed result to delete it. It’s as easy as that — and a lot more convenient than clearing your entire history. To selectively remove certain sites from your browsing history, pull up your history, right-click on a domain you want to remove, and click “Forget About This Site”. Instead, you’ll have to clear your browser history entirely via the triple-dot menu > Settings > Privacy & security. Click on “Choose what to clear” under “Clear Browsing Data”, select “Browsing history”, and get rid of all of it. It’s an inelegant solution to a common problem, and one that Edge users have already voiced to Microsoft. Will Microsoft make any changes? Don’t hold your breath. To delete your browser history, just click on “Safari” in the upper-left corner of your screen and select “Clear History”. Pick how much history you want to eliminate — likely everything — and click on “Clear History”.